COLIN KERRIGAN TTN The modern exterior of New Dehli bears a sharp contrast to the traditional food offerings patrons can enjoy inside. 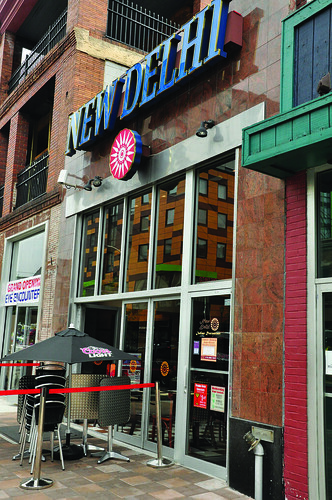 New Delhi, an Indian restaurant at 40th and Chestnut streets, boasts the title of the oldest Indian restaurant in town. The environment is relaxing, and the people who dine there are mostly young professionals and college students. Located in University City, the restaurant features a glass façade that faces the street and an interior that’s modern and chic – similar to the setting inside stores of gourmet-sandwich chain Così. New Delhi offers two daily buffets in addition to menu items. The lunch buffet costs $9, the dinner is priced at $12, and most menu items fall around $10. If you’re looking to have a drink, New Delhi also offers beer, wine and a slew of mixed drinks, as well as refreshing mojitos – in traditional and mango flavors – and two kinds of beer imported from India, Taj Mahal and Kingfisher. The buffet offers a decent selection of popular dishes: chicken tikka masala, tandoori chicken, basmati rice and delicious samosas. The buffet offerings change frequently, so you might find different dishes from one day to the next. Customer service is all right, but New Delhi does deliver, which is an option for patrons who live in the area. As the old adage goes, “All things improve with age.” So the next time you crave a spicy Indian meal, check out New Delhi to discover what time has done for this longstanding Philadelphia restaurant. John Kennedy can be reached at john.kennedy@temple.edu. The bad reputation pit bull have has more to do with nurture than nature.